pwoodford.net is the web domain of Paul Woodford, writer, blogger, amateur photographer, cook, Hash House Harrier, fighter pilot. Paul's Thing: a blog about life, culture, books, consumerism, politics, the media, war, flying, motorcycling, bicycling, current events, and the internets. Half-Mind Weblog: a Hash House Harrier blog containing advice, chalk talk, interviews with prominent hashers, rants & editorials, and a hash songbook. Crouton's Kitchen: a cooking blog featuring recipes and commentary on cooking, grilling, and smoking. It's what's for dinner. 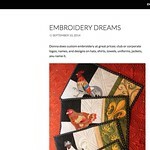 Embroidery Dreams: Donna Woodford's embroidery site: custom embroidery, great prices.